There really isn’t much news here from my side. I have been trying to keep my mind totally occupied while my better half is in work. I can’t believe I’m going to say this but I have even cleaned the windows in the house, inside and out! This is a first in the three years that we have owned the house. And really, I can’t see why I don’t do it more often. It doesn’t take much effort but gives a lovely result and I now find myself staring at the windows and their shinyness… They are soooo pretty! The house has never been so clean and organised. Now of course, there is still a LOT to do (like unpacking the other fourteen boxes in the attic) but bit by bit and one day hopefully soon, there will be nothing left to do, It’s a bit like painting a lighthouse I guess. By the time you finish, all that’s left to do is start all over again from the bottom up! This recipe can be made in any format really. It is the same recipe I would use to make a round deeper apple pie, just with double the pastry (to deal with the size of the tray). But if you want to feed lots of people and need something that can be picked up and eaten in hand, then this is the recipe for you! Pre heat the oven to 180 C. Cut the pastry into 2 pieces. Dust a work surface with flour and roll out one half. Try to make it rectangular and depending on the exact size of your baking tray, make it about 1.5 inches larger than your tray. My tray is 26 cm x 38 cm in size. Grease your tray and line the bottom with baking paper (I find it much easier to take out of the tin when lined). 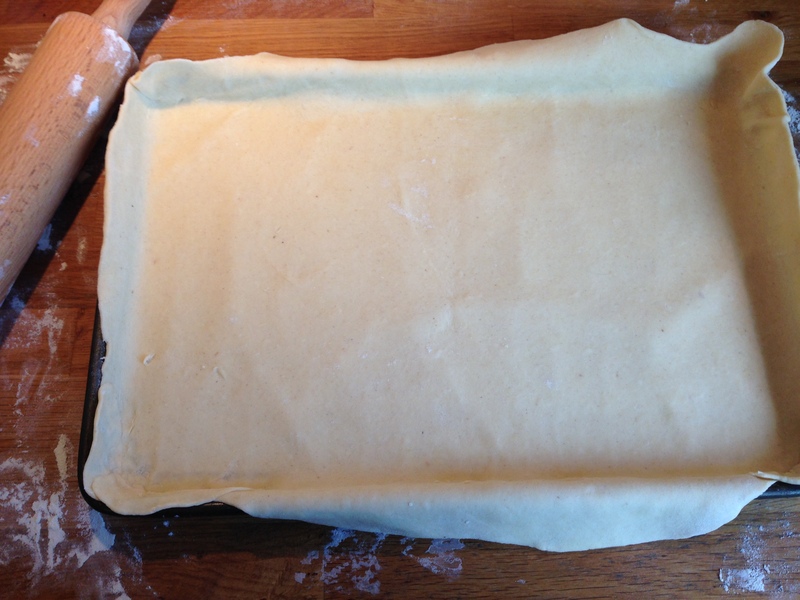 Place the rolled out pastry in the baking tray and press into the edges gently. Put this in the fridge while you prepare the filling. 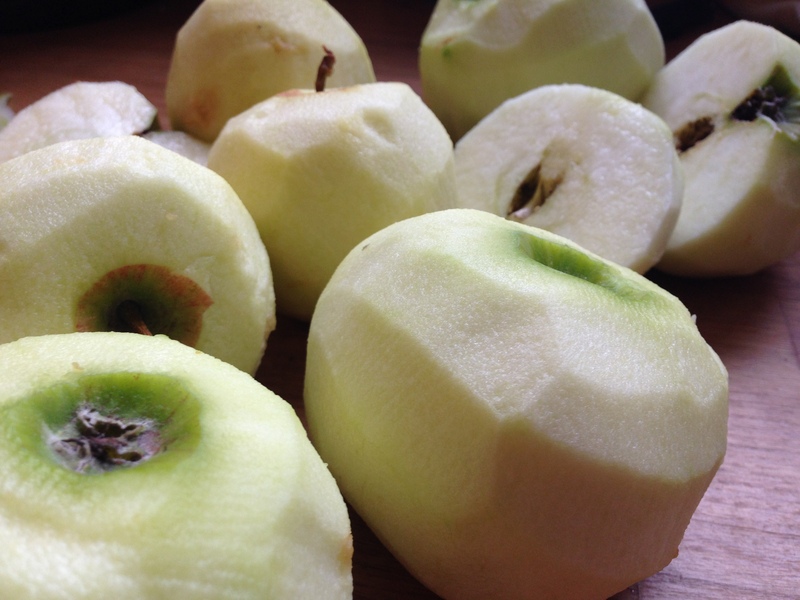 Take your apples, peel, core and dice them. Put in a large bowl and mix them with the lemon juice, making sure they are all coated. Then add the cornflour, cinnamon, ginger, 130 g of sugar and your raisin mix. And mix well. Pour this mix into a large flat pan and heat for a few minutes until the sugar begins to dissolve. Take off the heat (this doesn’t need to be HOT, just warm). 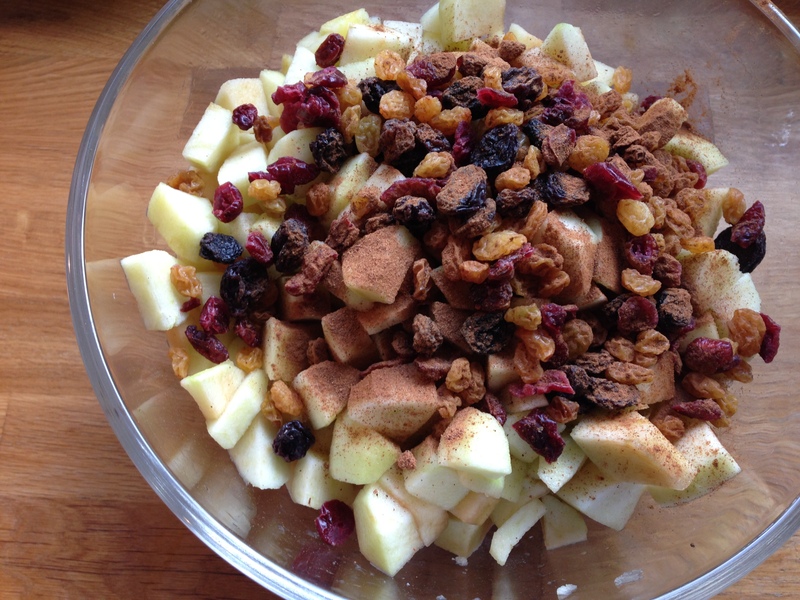 Take your pastry-lined tray out of the fridge and pour the warm apple mix into it. Sprinkle with the remaining 20 g of sugar. Roll out the second half of your pastry, (in a matching rectangular shape). 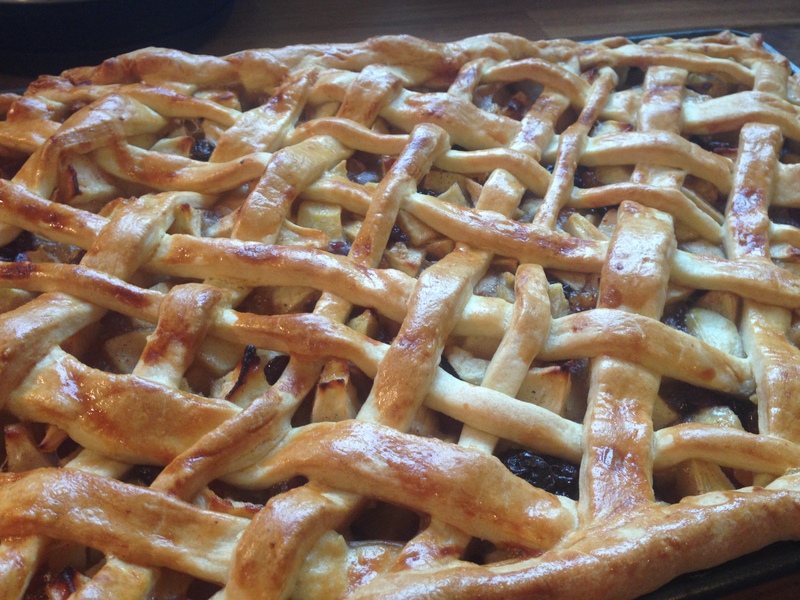 I made a lattice style cover for the pie as it’s my personal favourite. But you can also just lay the whole piece of pastry over the tray, seal the edges and make slits in the top to let the air out. 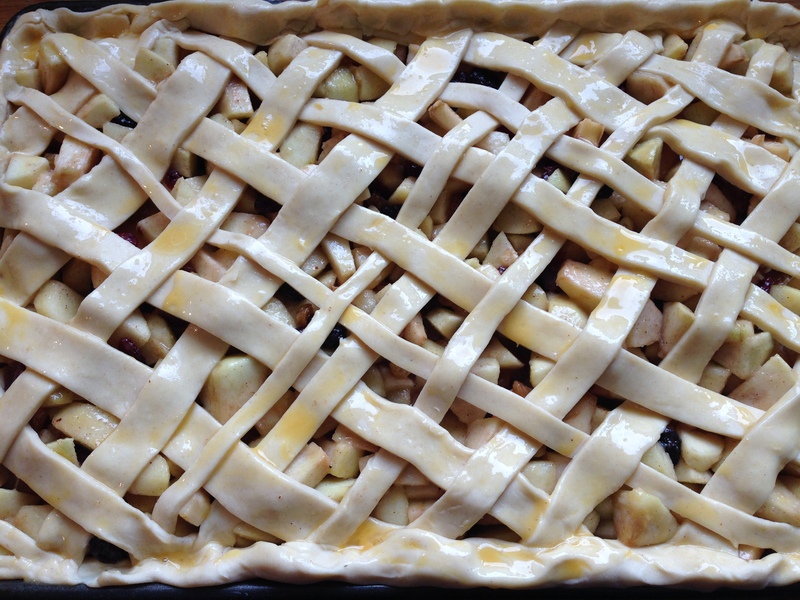 To make the lattice top, cut the pastry into long strips and place half of them diagonally in one direction over the apples. Then from the opposite diagonal, place the remaining strips. 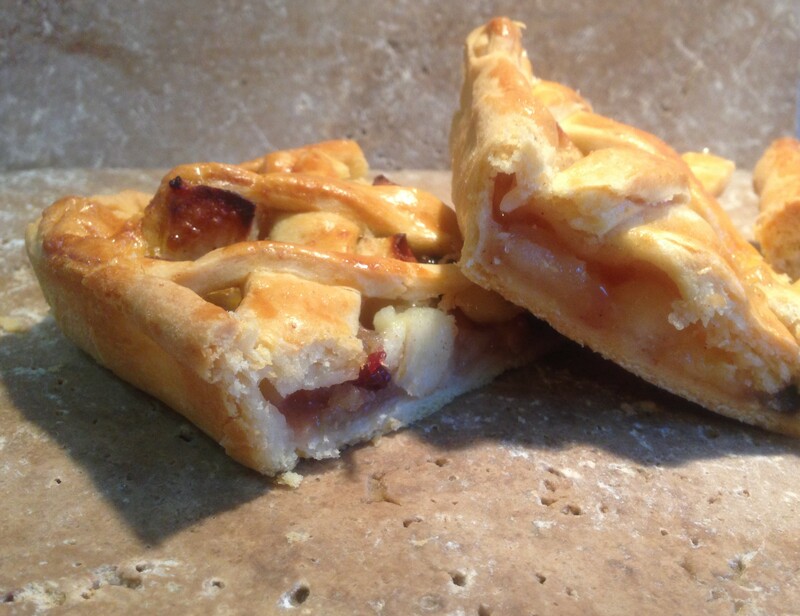 Press the edges firmly against the bottom layer of pastry to seal shut. Brush with beaten egg and pop into the oven for about 40 minutes, until golden brown. Cool in the tin. 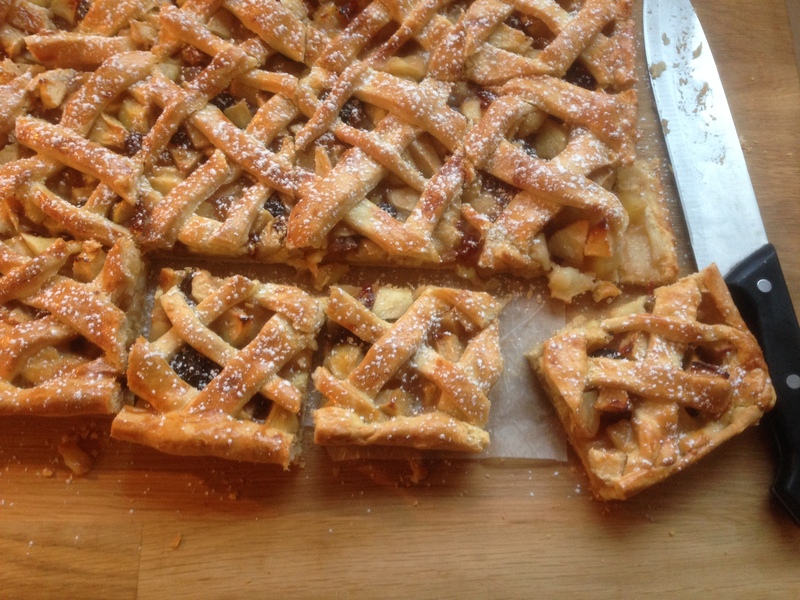 When cool, remove from the tin and cut into 3 inch squares and dust with icing sugar. Serve warm or cold. I am also available for testing!